This photo of the Dancyville School was taken in 1999. This was long after the building ceased to be a school. Haywood County School Board has confirmed the Dancyville School closed in the Spring of 1969. The school was built in l929 in time for the l929-1930 school term to start. the first year we lived there. Mrs. Irene Kennedy was the principal. Methodist Parsonage. Everyone was happy with an updated, safe school. teacher and Olivia Powell (from Springhill) was the primary teacher. started (a real adventure through Hatchie River Bottom on rainy days). sacks, and all the students and three teachers walked the mile to Mr.
was pink and mine blue. The dress pattern was supposedly utmost "chic"
wear slippers with inch heels. It was really a "coming out" for some of us. The boys wore dark coats and white pants, neckties and slicked-down hair. Dorothy gave a serious valedictory address and I gave a comical reading. making this a real time to remember in their education. The above sign is in front of the J. B. Moore Community Center, the former Dancyville School. 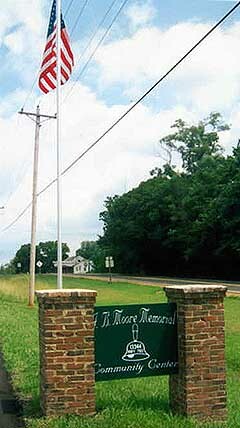 To the right is the sign and the flag and pole in front of the center. The Flag pole was installed by Bill Duncan and the flag provided by Darrell Thomas. Joan Williams designed and furnished the sign. Bill Duncan did the brick work for the sign. GO HERE for the INDEX of Mrs. Routon's many contributions to the Dancyville web site. GO HERE for the INDEX of Mrs. Virgie Naylor's contributions to the Dancyville web site. GO HERE for index to the J. 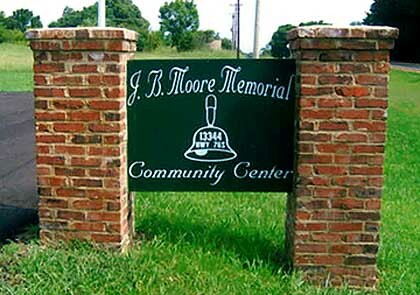 B. Moore Memorial Community Center Photos.